During my vacation I was fortunate to tour Australia for a month. Many of the tourist sites I visited celebrated the 50th anniversary of the outcome of the 1967 referendum in which Aboriginals and Torres Strait Islands were finally accepted as citizens within Australia. Despite this act of social inclusion, the disparity between Indigenous and non-Indigenous Australians is still clear. For example between 2014-2016 Indigenous children aged 0-4 were more than twice as likely to die than non-Indigenous children (Australian Bureau of Statistics, 2016). This led me to question the extent to which Indigenous peoples have been included within Australian society today, over 50 years on from the vote. In this report I will analyse the stigma surrounding the Indigenous community and their subsequent spatial exclusion. I will finally examine how the Palm Island incident in 2004 illustrates how Indigenous Australians are perceived as “out of place”. Arguably the exclusion of Aboriginals is largely symbolic. This form of exclusion is closely related to the concept of stigma, the severe social disapproval of an individual or group with stigmatized groups suffering exclusion as a result (May, 2013). Sibley (1995) refers to Object Relation Theory to explain the need to differentiate between “Self” and “Other”. There is an association of the defiled “Other” with bodily residues making them “dirty” (Sibley, 1995). Aborigines have often been depicted as “dirty” in European colonialist art. 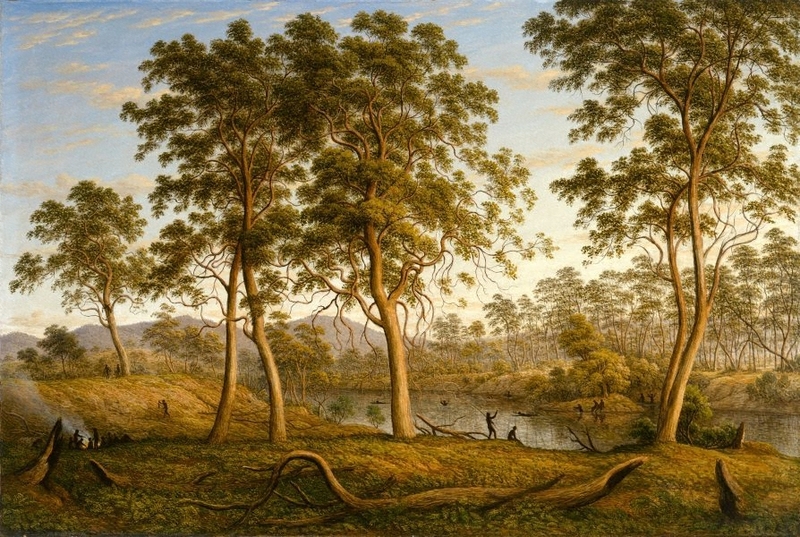 I was drawn to a particular painting by John Glover, who was informed by European notions of a landscape unsullied by European contact (Art Gallery of NSW, 2018). The indigenous subjects are naked, dirty sitting by the river in the mud (Figure 1). This seems to embody notions of the “primitive” man, who doesn’t follow Western notions of “civilised” behaviour and therefore is labelled as inferior and the “Other” (Cresswell, 1996). There is a fear of the self “becoming polluted” by the deviant groups (Sibley, 1995). Therefore the imposition of Otherness alienates the labelled person from the centre of society, placing them at the margins since they don’t conform (May, 2014). Indeed Glover’s painting seems to neglect the reality, dispossession and violence at the hands of the colonists (Art Gallery of NSW, 2018), who justify their actions since they deem themselves superior and thus are able to push the original inhabitants out of their ‘civilized’ society. The symbolic exclusion of indigenous peoples leads to their spatial exclusion. Exclusion is an active process and in many cases involves the deliberate distancing of a subordinate group by and from another dominating group (May, 2014). Indeed, the dominating group carries out the ‘purification of space’ by constructing social-spatial boundaries that push the “Other” to the margins of society (Sibley, 1995). This is evident in the way in which the government responds to the problem of alcoholism within the Indigenous community. They impose “dry zones” in areas where people congregated to drink, often in the centre of cities or towns, issuing financial penalties to those caught consuming alcohol. Many of the accused are homeless or living in extreme poverty so cannot afford the fines. As a result, fines build up and some end up in prison. This strategy only serves to “drive people out into the margins or put them in jail” (Davey, 2015). In this sense legislation is actively pushing the “Other” from the centre of society purifying the space for the benefit of the dominant group, who are disturbed by the ‘drunken Aborigine’ stereotype (Saggers and Grey, 2002). In Queensland I spoke to a fellow holidaymaker Cindy from Melbourne about the perceived problem with alcohol and the Indigenous. She admitted it is a small minority that behaves that way, but they are very visible. Perhaps their exclusion to the margins make the few that come into society and drink excessively harm the reputation for all, leading to them being further excluded and stigmatized. The establishment of “dry zones” is not addressing what perhaps might be driving alcoholism in Indigenous communities, a sense of helplessness in the face of political and economic marginalisation and discrimination (Saggers and Grey, 2002). In short social exclusion drives alcoholism, which in turn leads to spatial exclusion as the government tries to manage the problem. In Sydney’s Museum of Contemporary Art I watched a rather shocking video installation by Vernon Ah Kee documenting a crisis of race relations on Palm Island in 2004. It seemed to remind the audience that even today, Indigenous people are made to feel “out of place”. According to Cresswell (1996) place is ideological. What behaviours and who is acceptable and unacceptable is transmitted through place and space. Place and space therefore must be created, reproduced and defended, particularly by the dominant group (Cresswell, 1996). Indeed we can explore the significance of place and space when things appear to ‘go wrong’ (Cresswell, 1996). It was apparent things went very ‘wrong’ on Palm Island. In 2004 Islanders rioted and burnt down the police station following the public revelation of the autopsy results on Mulrunji Doomadgee, who died in police custody from internal bleeding. Tension arose when it was announced the death was an “accident”; the reality was clearly police misconduct (MCA Australia, 2016). The police responded to the riots in a brutal manner, flying in extra police and officials from the mainland to control the minority, justifying their actions by presenting the islanders as “not law-abiding citizens” and barbaric (Lex Wotton in Davidson, 2018). They are therefore “out of place” since they don’t behave in a way that is deemed acceptable by the majority group. The artist himself admitted that “as a people, the Aborigine in Australia exists in a world where our place is always prescribed for us and we are always in jeopardy” (Ah Kee, 2010 in MCA Australia, 2016). However, processes of exclusion are never absolute (May, 2014). Ah Kee (2010) says that “[Aborigine] are continually having to build and re-build” (MCA Australia, 2016). Indeed processes of exclusion will always to some extent be resisted leading to the “transgression” of social space (Cresswell, 1996). Twelve years following the riots in Palm Cove, it was determined that the treatment of the Palm Island community by police was discriminatory and “an affront to the law” (Davidson, 2018). Therefore Queensland agreed to give islanders $30 million settlement. But it is clear the case didn’t just provide economic compensation for the Islanders, it shed light on the unjustifiable way in which the Indigenous communities were portrayed making it somehow acceptable for the police to act the way they did (Davidson, 2018). It could be argued that following this act of resistance the Palm Islanders have affirmed their right to the space and thus are no longer “out of place”. Despite the outcome of the 1967 referendum, it is evident that Indigenous peoples are not fully included within Australian society today, pushed to the margins on lands they have been calling home for 65,000 years. It will be interesting to see if the disparity between Indigenous and non-Indigenous Australians remains in the future in light of government promises to “Close the Gap” (Commonwealth of Australia, 2018) and acts of resistance such as those in Palm Island, that affirms Aborigine “place” within the centre of society. Art Gallery of NSW (2018). 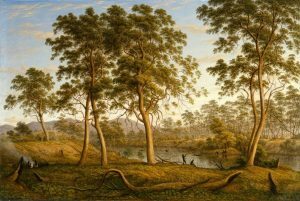 John Glover: The Collection: Art Gallery NSW. [online]. Available at: https://www.artgallery.nsw.gov.au/collection/artists/glover-john/ [Accessed 22 September 2018]. Australian Bureau of Statistics (2018). Aboriginal and Torres Strait Islander Deaths in Deaths, Australia, 2016. Canberra, Commonwealth of Australia. [online]. Available at: http://www.abs.gov.au/AUSSTATS/abs@.nsf/Latestproducts/3302.0Main%20Features62016?opendocument&tabname=Summary&prodno=3302.0&issue=2016&num=&view=# [Accessed 22 September 2018]. Commonwealth of Australia (2018). Closing the Gap Prime Minister’s Report 2018. Canberra, Commonwealth of Australia: Department of the Prime Minister and Cabinet. [online]. Available at: https://closingthegap.pmc.gov.au/sites/default/files/ctg-report-2018.pdf?a=1 [Accessed 22 September 2018]. Cresswell, T. (1996). In Place/ Out of Place: Geography, Ideology and Transgression. Minneapolis, University of Minnesota Press. Davey, M. (2015). Alcohol abuse behind high rates of early death among Indigenous, study finds. The Guardian. [online]. Available at: https://www.theguardian.com/australia-news/2015/feb/20/alcohol-abuse-behind-high-rates-of-early-death-among-indigenous-study-finds [Accessed 22 September 2018]. Davidson, H. (2018). Queensland to pay Palm Islanders $30m over police response to 204 riots. The Guardian. [online]. Available at: https://www.theguardian.com/australia-news/2018/may/01/queensland-to-pay-palm-islanders-30m-over-police-response-to-2004-riots [Accessed 22 September 2018]. Glover, J. (1838). Natives on the Ouse River, Van Diemen’s Land. [Painting]. Available at: https://www.artgallery.nsw.gov.au/collection/works/48.1985/ [Accessed 22 September 2018]. May, J. (2014). Exclusion in Cloke et al. (Eds.) Introducing Human Geographies London, Arnold, pp.655-668. MCA Australia (2016). Artwork on Display: Vernon Ah Kee: tall man, 2010. [online]. Available at: https://www.mca.com.au/artists-works/works/2016.19/ [Accessed 22 September 2018]. Saggers, S., Gray, D. (2002). Explanation of Indigenous alcohol use in Saggers, S., Gray, D. (Eds.) Indigenous Australian alcohol and other drug issues: research from the National Drug Research Institute. Perth, National Drug Research Institute. Sibley, D. (1995). Geographies of Exclusion: Society and difference in the West London, Routledge. This entry was posted in Keble Geography. Bookmark the permalink. Hothouse earth: Fantasy or Reality?